Everyone likes a good film binge every now and then. Why not make a real occasion of it and hire our home cinema kit? Home Cinema Kits for Something Different! Maybe you are a couple and you need a break from the routine work and play organisation of everyday living. Some people go on weekend trips away. A far less costly kind of escape is to stay at home and binge on your favourite movie trilogy or TV series. What’s so special about that? Well, nothing, unless you hire a home cinema kit. Everyone knows that the best time to see a film at the cinema is in the afternoon. This is because there are far less people there. You get the sweet feeling that the cinema is all yours. Recreate that feeling in your home by hiring our home cinema kit! It doesn’t have to be a birthday or anniversary or any kind of special occasion: just do it for something different! Movies For Binge Watching On The Big Screen! Can’t decide on what to watch? Here are some good binge movies you might consider. The Lord of the Rings trilogy has to be the all-time daddy of binge movies. Get your hands on the extended versions to really go for it. That’s about ten hours of quality bingeing. This trilogy must be seen in the cinema to be truly appreciated. There are many stunning visuals including epic, spectacular scenery. The films are unforgettable and ridiculously entertaining. Now you can relive the cinematic experience of The Lord of the Rings by watching it on our home cinema kit. Why Not Go On A Binge of 80s Movies? Another movie trilogy that’s good for bingeing is the Back to the Future films. If you are a fan of time travel movies this trilogy won’t disappoint. If you are nostalgic for the 80s these films will satisfy it. With our home cinema kit, you can relive the experience of going to the movies as a kid in the 80s. Films such as Back to the Future, Ghostbusters, Gremlins and The Goonies are all available to buy on Blue Ray which means they can enjoyed on the big screen at home. 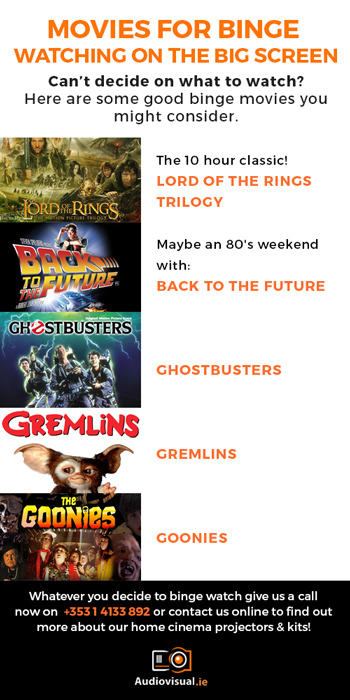 In fact, why not go on a binge of 80s movies over a weekend? We all need to go crazy every now and then. Film bingeing is certainly one way to do it. If you want to really go for it, consider hiring our home cinema kit. We guarantee you will want to do it again and again. There is nothing like bringing that cinema magic into your home. So why not go ahead and treat yourself to a good film binge over a weekend? With our home cinema kit, you are sure to go the distance. Give us a call now on +353 1 4133 892 or contact us online to find out more about our home cinema projectors & kits!